Alright, as one of StarCityGames.com's stable of world-class Commander writers, I've made it my goal to make sure we've got deck coverage of all the new legends from Commander 2013. Now we're nearing the end of the run, and it's Marath, Will of the Wild's turn. When the product first came out, I did a review of the preconstructed deck Marath was featured in and walked through how to tweak the deck out of box to juice it up for a few dollars but keeping most of it intact. 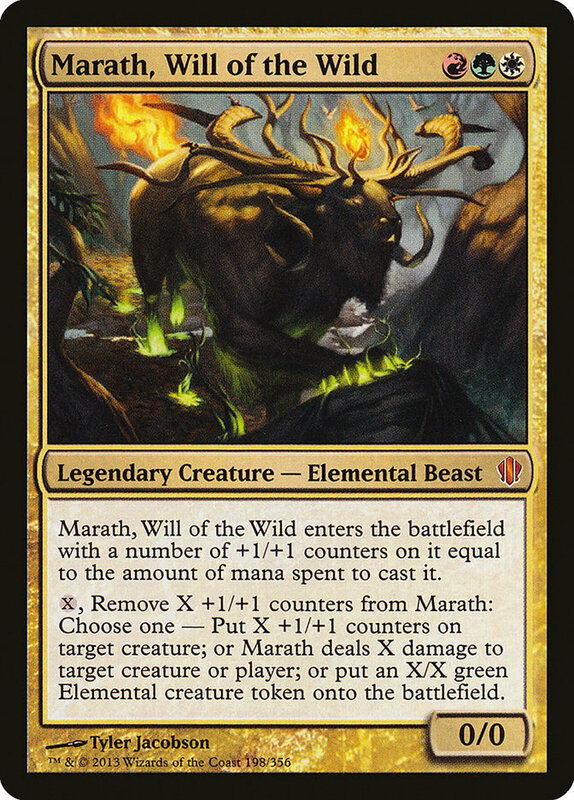 Today I'm building a Marath deck from the ground up and seeing where this Elemental Beast takes me. Since it was printed, I've had the pleasure of playing against Marath a few times, and I've found that it's a remarkably powerful threat all on its own. While there's a handful of the new legends that get an enhanced effect each time you've got to pay the commander mana tax, Marath is one who gets physically bigger and more powerful. It creates a neat Obi-Wan Kenobi-esque tension of "if you kill me, I'll come back stronger" that puts the screws on the opponents, especially since Marath starts so cheap. Taking a hard look at Marath, Will of the Wild tells a couple things. First, it's quite mana intensive to use its abilities to its fullest, and the more +1/+1 counters it gets, the more mana you'll want to sink into it. Second, it can provide a pretty steady stream of +1/+1 counters if that's something you're in the market for fairly efficiently—compare to Spike Feeder or Spike Weaver, which cost two mana to move a +1/+1 counter over. Next up, it can be a shotgun to mow down a bunch of little guys, one or two bigger guys, or one or more faces across the table. Lastly, if you're in the market for making tokens, Marath can do that pretty easily too and quite flexibly—you can make 1/1s, 2/2s, 3/3s, or even bigger or any combination of those depending on your needs. In the Naya color combination, it's pretty easy to find cards for any of these aspects, and if we're going for a sort of "good stuff" approach with Marath, we could sprinkle in things that take advantage of both. I typically like to build more focused decks, and today I'm going to be leaning quite heavily on the +1/+1 counter theme. This is because I really love adding +1/+1 counters to my creatures. Absolutely love it! Nearly half the deck—including some lands—deals with +1/+1 counters, and I only scratched the surface of what I could have put in here, making some hard cuts along the way to make room for some other stuff. I really love how many great themes over the years put +1/+1 counters on creatures: the Spikes from Tempest block, the Simic abilities of graft and evolve, the devour mechanic from Jund, various and sundry Hydras, on up to the monstrous mechanic from Theros. Speaking of Theros, I've been dying to play Ordeal of Nylea in just this sort of deck given how easy it is to put it on something that already has +1/+1 counters you can attack with and trigger it right away, helping you to ramp—something you already want to do in a deck with Marath. 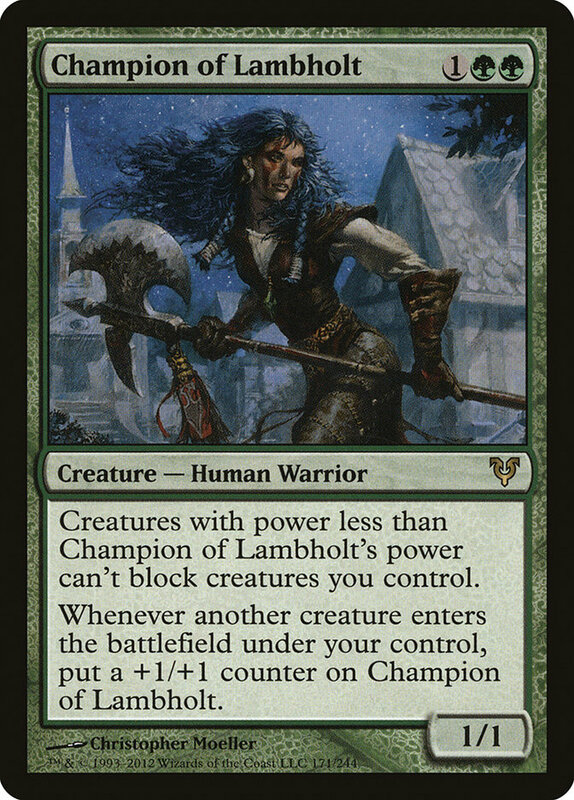 Champion of Lambholt is a creature that's gotta be good in Commander sometimes, but I always end up cutting him because competition for the three-mana slots is fierce in the Commander card pool. In this sort of deck that is all about the +1/+1 counters, I think he easily earns a spot! Opal Palace is already a sweet Commander card for any commander you plan on attacking with but is just even more juiced up with Marath. Etched Oracle was something I skimmed past at first because the best you can do with sunburst is to put three +1/+1 counters on it and you need to remove four in order to draw three cards, but then I figured it would be pretty easy to load this guy up with a lot more counters than four over the course of several turns. I haven't drawn him yet so I'm not sure he's going to be worth the slot, but I'm willing to give him a try. Just imagine moving a bunch of counters from Forgotten Ancient over to this guy! 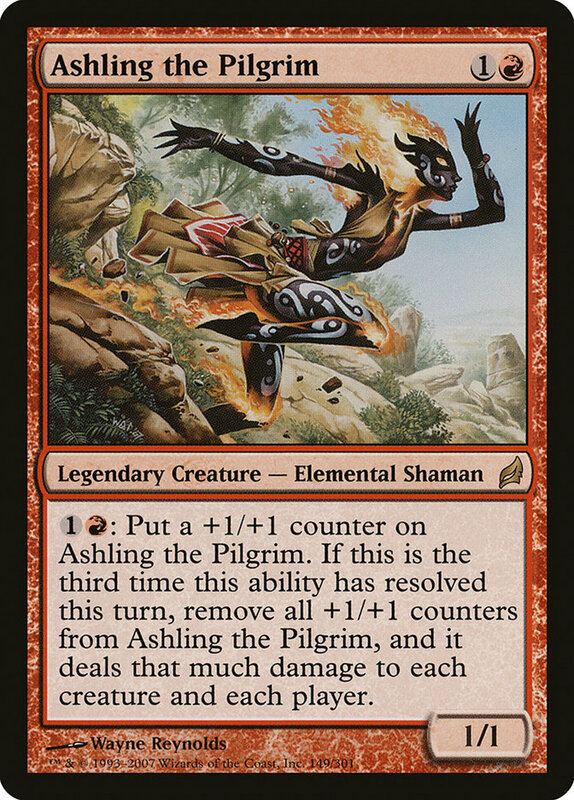 Speaking of moving a bunch of counters over, I thought loading up Ashling the Pilgrim with a bunch of +1/+1 counters before you begin her three-activation time bomb could lead to quite a big mass explosion. 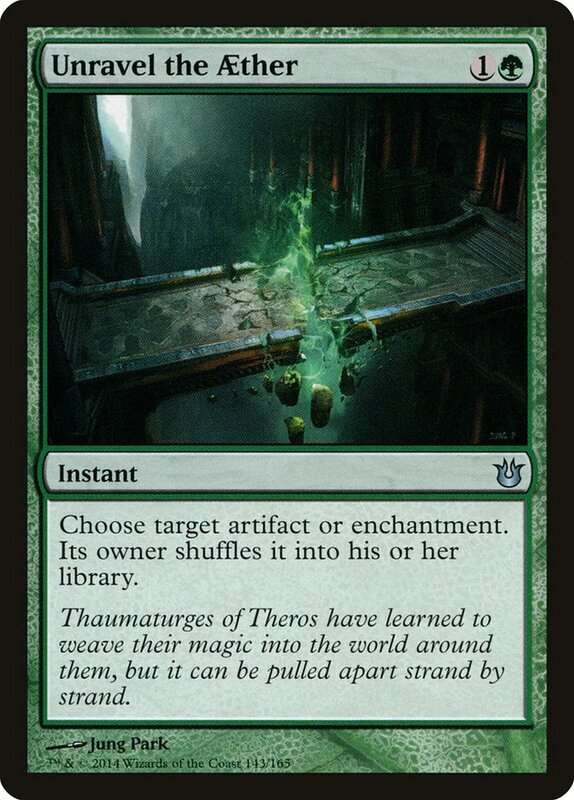 I'm a little leery about playing Bane of Progress considering I've got a fair number of artifacts and enchantments in the deck, but it's such a potent sweeper that can potentially end up gigantic that I figured it earns a slot. I've been dying to play Slumbering Dragon in a deck for a while—I like how it can really play a bit of a rattlesnake, preventing people from wanting to attack, but I've always been concerned about being able to wake Smaug Jr. up when I need him awake. I don't think that'll be a problem at all in this deck. Persist: Creatures with persist like it when +1/+1 counters are being handed out since they will neutralize the -1/-1 counters that prevent the creature from coming back from the dead again, so adding Twilight Shepherd and Woodfall Primus was an easy choice, as was Cauldron of Souls. Mana: Sol Ring, Ordeal of Nylea, Fellwar Stone, Darksteel Ingot, Chromatic Lantern, Scuttlemutt, and 40 lands. Marath wants a lot of extra mana lying around, so I made sure to fatten the deck up with mana acceleration and steady land drops. Busting the Gods: One thing's for sure—Commander post-Theros is a whole different world than pre-Theros. Having cheap indestructible commanders that are also often immune to removal like Swords to Plowshares, Bant Charm, or Hallowed Burial can really make you vulnerable in uncomfortable ways, especially if that commander is Purphoros, God of the Forge. I've taken to including cards like Deglamer (and soon the new version Unravel the Aether), Act of Authority, Altar's Light, and Return to Dust to give me the tools to deal with that sort of problem. Basilisk Collar: Equip to Marath and you've got an insanely easy way to kill off just about any creature on the board. Yowza! I added Goblin Bombardment to the deck just to give me an "oops, I win!" out to other powered-up decks that I might otherwise have problems defeating; with a Goblin Bombardment, a creature with persist, and either Juniper Order Ranger or Cathars' Crusade, you can sacrifice the persist guy over and over again for a point of damage each turn. If that persist guy is Woodfall Primus, then you could potentially achieve a perfect victory by nuking every opponent's permanent while killing their creatures before getting around to killing them directly. If you're not playing at a high-powered table, a much more reasonable and friendly version would be Barrage of Expendables. So what do you think of my Marath, Will of the Wild Commander deck? What do you have in your Marath deck that I might have overlooked? Post questions and thoughts in the comments below. And that pretty much leaves just one 2013 Commander legend untouched, so make sure to join me next Friday when I make a special announcement that will reveal why I haven't done a write up for that card here among other things!